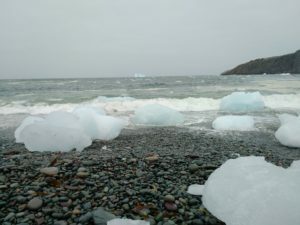 Also posted on the Logy Bay-Middle Cove-Outer Cove Museum blog. 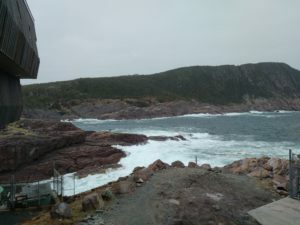 Last week’s post was about a helicopter rescue off Logy Bay where three men were lost on the ice. Two of the men were rescued, one by local fisherman and the other by the combined effort of the Royal Canadian Air Force (RCAF), United States Air Force (USAF), Canadian Coast Guard and the United States Navy. At the end of last week’s post, William Dunn, was still missing. Dunn had gone out sealing with two others on the evening of March 28th, 1953. The two other sealers came back around 11pm, but Dunn went missing. His companions said he had become ill at some point. After the adventures of March 29th, Dunn was still missing, although his brother and another sealer, Frank Olsen, were safely off the ice. The USAF helicopter brought in from Harmon Field, Stephenville, had to call off the search when it got dark. Logy Bay, spring 2017. Photo by Lisa M. Daly. On March 30th, the search continued. The helicopter was piloted by Captain Lamar Willis of Springfield, Ohio, and Lieutenant James Stevenson of Chattanooga, Tennessee. Early on the 30th, the helicopter made an attempt to search, but the morning fog off the coast sent them back to Torbay. Later in the morning, Willis made a second attempt and searched the area from Red Cliff north to Red Head and ten miles out to sea. That afternoon, the helicopter went out again and searched from Red Head South to Sprigg’s Point on the south side of Freshwater Bay. Overall, the helicopter spent 5 hours searching the ice at a height of about 250 feet. They found no trace of Dunn. That afternoon, the helicopter was joined by two RCAF Cansos. 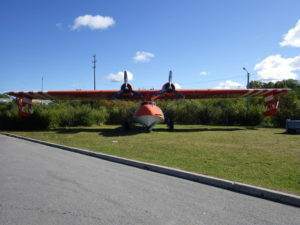 Canso 9830 and Canso 11024 flown by First Officer Jack Vincer and First Officer Hal Hinton flew the two aircraft. Along with the USAF helicopter, a combined time of 9 hours and 5 minutes were spent searching that day. While the air search was happening, reports were coming in of a man being sighted on the since some distance off the shore. These areas were check by air, and also by an RCMP team who were searching the ice from the land. On March 31st, the weather was poor and no flying was done out of Torbay. 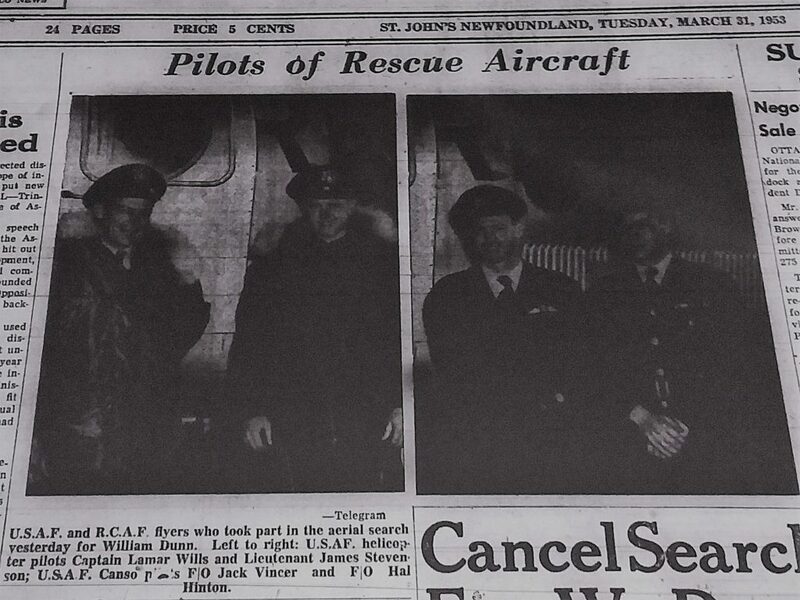 By this point, Flight Lieutenant Carl R. Ensom of 103 Search and Rescue Squadron Torbay (SAR) determined that any further search would be futile. Dunn, from Tunis Court in St. John’s, was 31 at the time, and the father of either 5 or 6 children (the newspapers give conflicting reports). He was known to the RCMP as we himself was a former member of the police force, and he served with the Navy in the Second World War. His current employment was at the Car Shop of the Canadian National Railroad. Ice at Middle Cove, spring 2017. Photo by Lisa M. Daly. Ensom also issued a statement that “the air rescue service was not provided for the purpose of picking up people who are foolhardy enough to take a chance on dangerous ice”. This statement was not in relation to the Dunn brothers and Olsen, but rather in reaction to children playing “copying” in St. John’s Harbour. This is a game where kids would jump to a pan of loose ice and leap to another before the first one sinks under their weight. This is a particularly important warning seeing as SAR was having difficulty searching for the missing sealers due to weather conditions. 1953 130 “R” Unit Det Torybay Nfld. RCAF Base Diary, 24 March 1953 – 31 March 1953. On file: LBMCOC Museum. 1953 Cancel Search for W. Dunn. The Evening Telegram, 31 March 1953, p. 1. 1953 Find No Trace of William Dunn On Drifting Ice. The Daily News, 30 March 1953, p. 3. 1953 Search and Rescue Official Warns the Foolhardy. The Daily News, 31 March 1953, p. 1. Thank you to Darrell Hillier for passing on the relevant page from the base diary. It is now on file at the museum. I happened to be at the library when it was sent, and decided to look for the results of the search in the local papers.